I’m working with Tamron Lenses on a variety of projects, and they just recently sent me their SP 24-70mm F/2.8 Di VC USD to put to the test in the video environment. I shoot a fare amount of photos, but I really focus on the video mode of my Canon 5D and 7Ds. For the last few years I've been shooting with Tamron's 28-75mm F/2.8 and though I've loved it's simplicity and sharpness, It lacked image stability, IS, which Tamron calls Vibration Control, VC. I was often limited to shooting video on tripods, or other stabilizing rigs, (which was actually a blessing in disguise because it forced me to shoot with more preparation and planning instead of just from the hip) but I would often find myself in situations, (following workers through coffee estates in Central America) where I needed to move quickly and capture video at an uncontrollable pace. Keep in mind, I'm speaking from a video perspective, but the stabilization is also extremely beneficial to photographers. It will allow you to shoot handheld in even lower light. It gives an extra 3 stops of handheld shooting in low light, and perhaps more if you have your yoga breathing techniques dialed, which I don't. Tamron has truly answered one of my gear prayers by releasing their 24-70 F/2.8 VC! While Canon has had a version on this lens for years, but never with stabilization, they are now on their second generation of this lens, and still, no stabilization! Not to mention they're wanting $2,299 for it. While Tamron is able to get theirs in your hands at $1,299, with VC! How does it compare to Canon's? They're both built extremely solid and out of high quality, durable material. They both produce an extremely sharp image and they both have impressively fast, quiet auto focuses. But for me, the big separation between the two versions is stabilization. Tamron's VC opens a whole new realm for high caliber video and photography in low light. 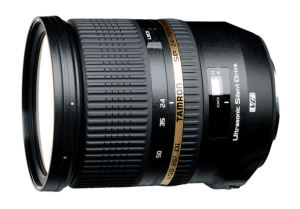 Not to mention the $1,000 you'll save that could go toward Tamron's 70-200mm F/2.8 VC. There are a few comparisons of Canon and Tamron's 24-70 F/2.8 out there on YouTube and they all say basically the same as I just shared, though some people claim the Canon is sharper around the edges, but if so, BARELY, and you need to zoom in 200% to even see it, That doesn't come even close to outweighing Tamron's VC and price point. Tamron has created and extremely powerful tool for capturing high-end content in a variety of environments and situations. I have a new "go to" lens! Great job and thank you Tamron! I can't wait to share this lens in my future talks and workshops!